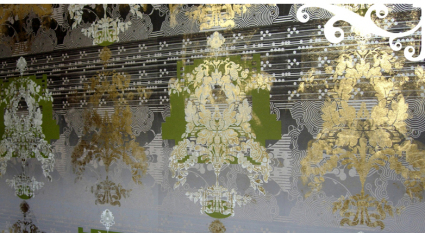 London designer Linda Florence has stepped the idea of basic wallpaper up several notches by adding a compelling interactive element: scratch off the silvery top layer to reveal the brightly colored pattern beneath. Similar to scratch-off lottery tickets, you can bet this stuff would have quite the addictive quality. But unlike "scratchers," you won't hit it big in any kind of monetary way - instead you might find you've contributed to some very cool wall space, as well as made a big pile of silver mess on the floor. Oh, well - what did you expect? Linda Florence's wallpapers tend to combine such diverse elements as traditional textile patterns, themes from the 1980s, science, and graphic illustration into one cohesive, flowing pattern that she somehow manages to pull together. As illustrated in her scratch card wallpaper, she plays with reflective foils, colors and surfaces to enhance the interaction between her work and the observer. 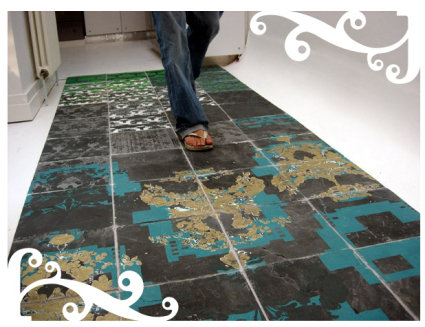 Her work can be found in several public and private arenas, and also includes such media as floor tiles and laser cut wall art. Currently, she can be found as an exhibitor at Exempla "Living Workshops" in Munich, Germany from late February until March 5th, if you happen to be in the area. Found via dwell and sourced dezeen, too. Jesus Tablet: Savior Of The News Industry? Or In Need Of A Resurrection?